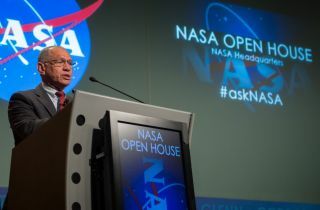 NASA Administrator Charles Bolden speaks at the NASA open house event, Friday, Jan. 18, 2013, at NASA Headquarters in Washington. NASA opened its doors to the public Friday as part of the festivities surrounding the inauguration of President Barack Obama. Visitors to the open house were able to participate in question and answer sessions with NASA officials covering a wide range of topics and take part in hands-on demonstrations. NASA has taken its huge database of technical reports offline in response to the arrest last weekend of a former contractor suspected of spying for China. The space agency decided to shut down the NASA Technical Reports Server (NTRS) as part of a broad security review spurred by the arrest of Bo Jiang, who was grabbed by FBI agents Saturday (March 16) on a China-bound plane at Dulles International Airport outside Washington, D.C.
"I’ve closed down the NASA Technical Reports database while we review whether there’s a risk," NASA chief Charles Bolden told the House Appropriations Committee Wednesday (March 20) during a hearing set up to probe possible security lapses at space agency centers. Rep. Frank Wolf (R-Va.) announced Jiang's arrest at a press conference Monday (March 18), during which he also voiced concern about the information freely available in databases like the NTRS. "NASA should immediately take down all publicly available technical data sources until all documents that have not been subjected to export control review have received such a review and all controlled documents are removed from the system," Wolf said. At Wednesday's House hearing, Bolden pledged to undertake a broad internal review of space agency security protocols. NASA has taken other actions in addition to closing down the NTRS, Bolden added. For example, he has tightened access to NASA facilities for people from countries viewed as espionage threats, including China, Burma, Eritrea, Iran, North Korea, Saudi Arabia and Uzbekistan. No new access will be granted to citizens of those nations until further notice, Bolden said, and the ability of existing NASA workers from those countries to access agency facilities via remote computers has been temporarily suspended. "NASA takes all your allegations of security violations, and those from anyone else, very seriously," Bolden said during the hearing. "This is about national security, not about NASA security, and I take that personally. I'm responsible and I will hold myself accountable once our reviews are completed." Not everybody is happy with the decision to take the NTRS offline. "Essentially, the mindset represented by Rep. Wolf and embraced by NASA fears the consequences of unauthorized disclosure more than it values the benefits of openness," Steven Aftergood of the Federation of American Scientists wrote in a blog post Wednesday. "It is a familiar outlook that has wreaked havoc with the nation’s historical declassification program,and has periodically disrupted routine access to record collections at the National Archives, as well as online collections at the CIA, the Los Alamos technical report library, and elsewhere," Aftergood added. Some experts said that the NTRS, and public access to NASA documents, may now never be the same. “There is a huge amount of material on NTRS,” space policy analyst Dwayne Day told Aftergood. “If NASA is forced to review it all, it will never go back online."